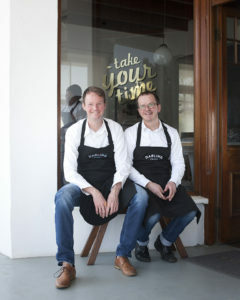 Darling Sweet came into existence when Frits van Ryneveld and Hentie van der Merwe met in September 2013 and decided to start a toffee factory in Darling; Hentie, with his passion for art and food, and Frits with his love for quality and design. Frits, who had been living in Darling for some years, was the first to come up with the idea. For him it was obvious that Darling ought to produce the most delectable old fashioned handcrafted toffees seeing as one of its main ingredients, butter, is historically linked to the small town with its picturesque surroundings. The idea didn’t take long to inspire Hentie – artist, lecturer and trained chef – to start journeying into the centuries old art of toffee making, tracking down long-forgotten toffee recipes and experimenting in their kitchen late into the night, while teaching art students about art and photography during the day. From the start their idea was to produce a range of high-quality toffees that are handcrafted using traditional methods and with no artificial colorants, flavorings or preservatives added, thus ‘clean label’ products. Furthermore, to produce a range of toffee flavors that are unique to Darling and its surrounds, using as many locally sourced ingredients as possible. 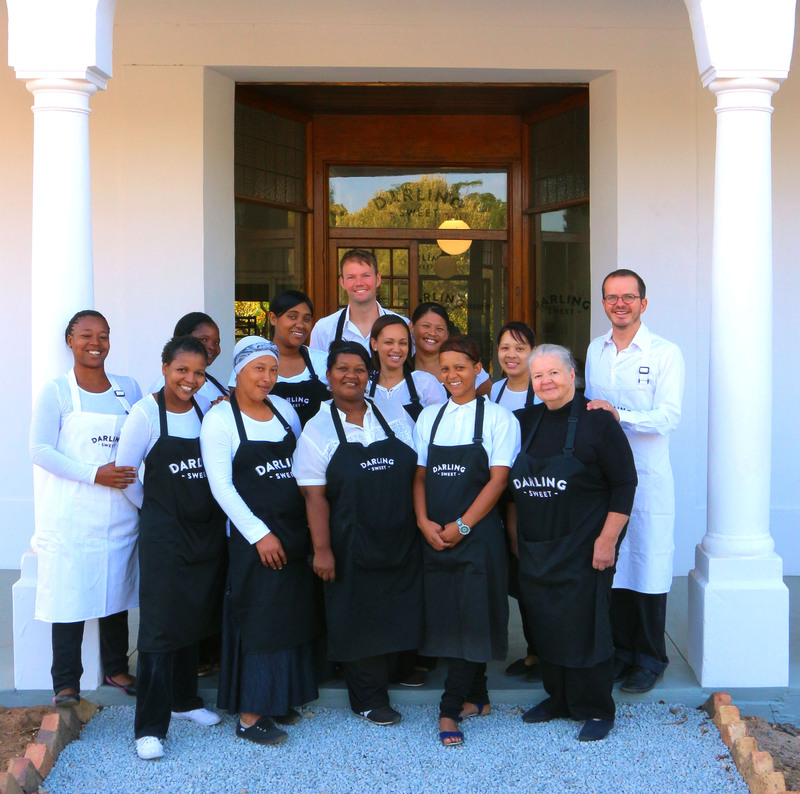 In July 2014 Frits resigned from his full-time job as a medical representative and they converted Frits’ 24m2 antique shop into a production kitchen and employed their first two members of staff. Here they started producing their first three toffee flavors; Tannie Evita’s Classic, Honey & Salt, and Sour Fig, which they sold at local craft- and food markets as well as at a few local outlets. Since then Darling Sweet has grown at a remarkable pace during which time Hentie also resigned from his lecturing position at Stellenbosch University to join the company full-time as product developer. Today Darling Sweet employs 21 full-time and 11 part-time members of staff and produces toffee products in a 500m2 production facility in the stately Edwardian building on Long street that once housed Darling’s General Dealer business. Since Darling Sweet took occupation of this architectural landmark of Darling in January this year it has also become one of the town’s top tourist destinations. Our product range has also expanded exponentially since the start of Darling Sweet and currently we have two product lines; toffees and toffee spreads. Our flagship product is our toffees, coveted for its flavor, authenticity, quality, uniqueness and honest ingredients and currently we boast ten flavours; Tannie Evita’s Classic, Honey & Salt, Red Wine & Chocolate, Orange & Cranberry, Coffee, Liquorice, Mint, Bird’s Eye Chili, Rooibos Chai and Ormonde Wines toffee. To complement our range of toffees we launched this year a range of toffee spreads in three of the existing toffee flavours; Tannie Evita’s Classic, Bird’s Eye Chili, and Honey & Salt toffee spread. We also market and sell under the Darling Sweet brand locally sourced raw veldflower honey and fleur de sel. Darling Sweet firmly believes in being involved in and supporting the Darling community and this we do mainly, but not only, through our support of The Darling Trust; a charitable trust set up by Pieter Dirk Uys that assists the Darling community by empowering individuals to help themselves, mainly through participation in the sectors of education, skills development and health. Apart from raising awareness of this trust through our marketing activities we also contribute financially by donating part of the proceeds of the sales of our Tannie Evita’s Classic Toffee to The Darling Trust. "I have received my toffee order and have tried all 3 flavours. I must add that I have never put anything so delicious in my mouth ever. They are all creamy and packed with flavour. I am so super impressed that i will no longer buy any other toffee again. My dad is from the UK and says its been years since he has tasted such good hard toffee. He walked off with Tannie Evitas toffee so i have lost a box. Thank you for producing such an awesome product. I will be back for more."